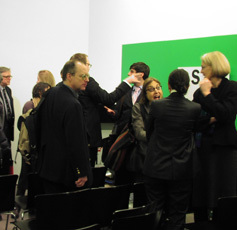 The book reception at Center for Architecture on Thursday evening was sensational! The line crawled out the door half the block down La Guardia Place… the seating once inside filled three spaces – the multipurpose hall downstairs, the mezzanine, and the library. All had projected video of the presentation held on the ground floor. The murmur and the luminaries present heightened the excitement of the launch of this three-year book project. Adrian Benepe, Commissioner of New York City Department of Parks and Recreation welcomed the audience and Deborah Marton, Executive Director of Design Trust, gave an impassioned speech about the process to institutionalize sustainable standards for park design. She stated that the deeply comprehensive publication is the first of it’s kind. This is the third set of guidelines from Design Trust. The others are High Performance Building Guidelines (1999) and High Performance Infrastructure Guidelines (2005). The primary authors are five Design Trust fellows – a team that includes landscape architects, a sustainability expert, and a water resource engineer: Michele Adams, Steven Caputo, Jeannette Compton, Tavis Dockwiller and Andrew Lavallee. Charles McKinney, Principal Urban Designer at Parks, a new role at Parks as of last year, was a moving force and champion of the project – with its 50 collaborators including landscape architecture firms, the NYC Parks Dept and Mayor’s office. There were 40 peer reviewers. David Bragdon from the Mayor’s Office of Sustainability discussed PlaNYC and how an interdisciplinary approach is the most sustainable. His plea for high-performance for all – humans and other species – was eye-opening. Jeannette Compton, a Senior Project Manager with Parks, was a primary author. She reviewed the table of contents of this beautifully and colorfully designed book of 279 pages. The chapters are based on linear process of design with varied access points. A pdf download is available at Design Trust. Jeremy Barring is the Parks Department’s Capital Projects arborist. This is another new job at Parks, which started in 2008. Trees provide more benefits as they get bigger. And that trees come up in almost every section of the book! Stephen Koren, a landscape architect with the Parks Department authored the playground site type. He reviewed a playground that had not been improved in 60 years and discussed the ways that each material was “chosen through a filter of sustainability”. Nancy Owens, landscape architect, principal of her own firm, discussed the development of Fort Totten in Bayside, Queens, as a case study for sustainable design (althougth the book was not available when the park was designed). This 149-acre peninsula includes Civil War–era fortifications, and the eight-acre section that was designed by Nancy Owens’ firm, North Park, was former WWI military site. The military buildings were demolished to create a beautiful park. When the book was published Nancy highlighted items in book that were relevant – from my view of the screen it looked like more than 3/4s of the checklist had been used for the Fort Totten project. 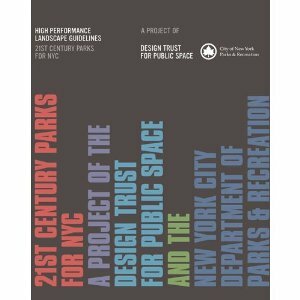 She feels that the book is scalable and will be very useful for all park designers. The natural history of the site is important, not just military history. When the first trees were planted the ambient sound changed… with birds & butterflies – almost a miracle within a day. The book is hardback and available at Amazon. Thanks for the synopsis. I wasn’t on my note taking game on this particular evening.